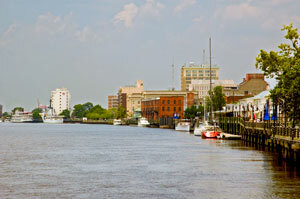 Wilmington is home to over 100,000 people and is one of the southern most cities in North Carolina. There are numerous advertising opportunities in this large city. Utilize out-of-home advertising for cheap billboard prices near the University of North Carolina Wilmington to capture hundreds of potential customers. Target your audience with outdoor advertisements near local stages such as the Red Barn Stage or the Level 5 at City Stage. The major highways running through Wilmington also provide billboard possibilities. Billboards on I-40 or I-140 would generate high traffic exposure of your business. Zip Codes: 28401, 28402, 28403, 28404, 28405, 28406, 28407, 28408, 28409, 28410, 28411, 28412.